King Solomon had a lovely way with words! In his book ‘Song of Solomon’, he penned down his relationship to a lovely lady. This gifted king was actually writing about Christ’s love for his bride. Through poetry, we learn how much God loves us. What a lovely way for God to show us his awesome love! At WiseDecor we have wall words that are suitable for the bedroom. ‘I am my beloved’s and my beloved is mine.’ wall letters look amazing above a black headboard on this light colored wall. 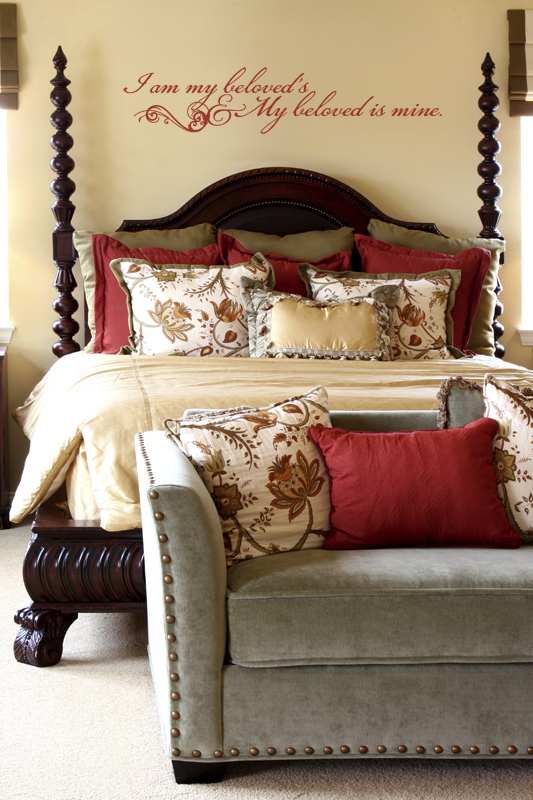 They also tie in well with the rest of the accents in the room: pillows on the bed and the gray chair. The wall lettering will be a constant reminder of God’s love and his unwavering commitment to you! Are you looking for unique, stylish and affordable wall quotes to decorate the wall spaces in your bedroom? Look no more: try WiseDecor products! Purchasing our wall lettering is real easy. To place your order on our user-friendly website, simply select a quote from our library. You may also submit a custom quote! Use the previewer to confirm that you have selected the right color, style, and size for your wall space. Submit and we’ll do the rest! Our designers are really good at what they do! Do call or email: let us help you decorate with wall words that build relationships!